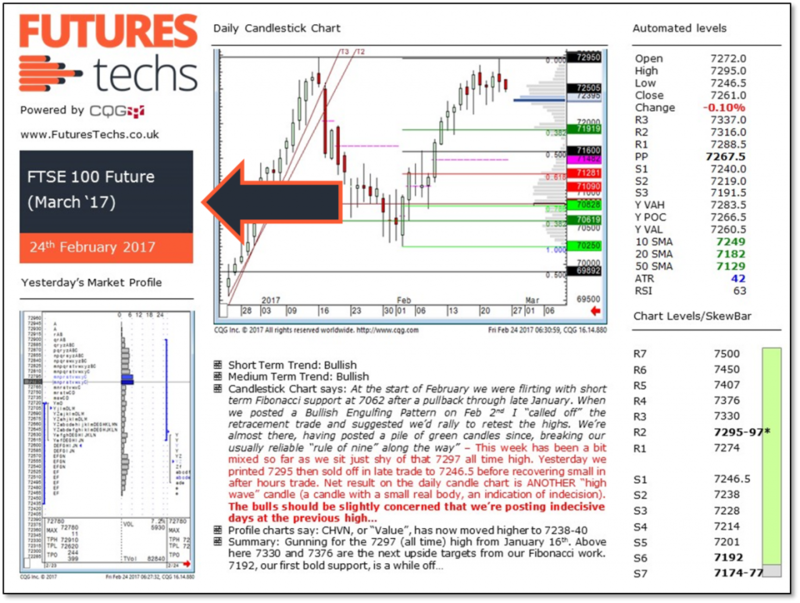 We have had a phenomenal response to our recent “Freebie” offer of 2 months’ Analysis on the FTSE and Cable, to help navigate through what could be a pivotal few months for the UK. On that basis we have a whole load of new readers, so I thought it would be useful to take a look at what’s in our reports, as there are many hidden gems that can be useful for traders and investors alike. Maybe obvious: What the report covers! But please note, we look at the Futures, not the “Cash” Index for Equity Indices, so there may be a difference in price and you need to adjust accordingly if you’re trading the “Cash” Index. 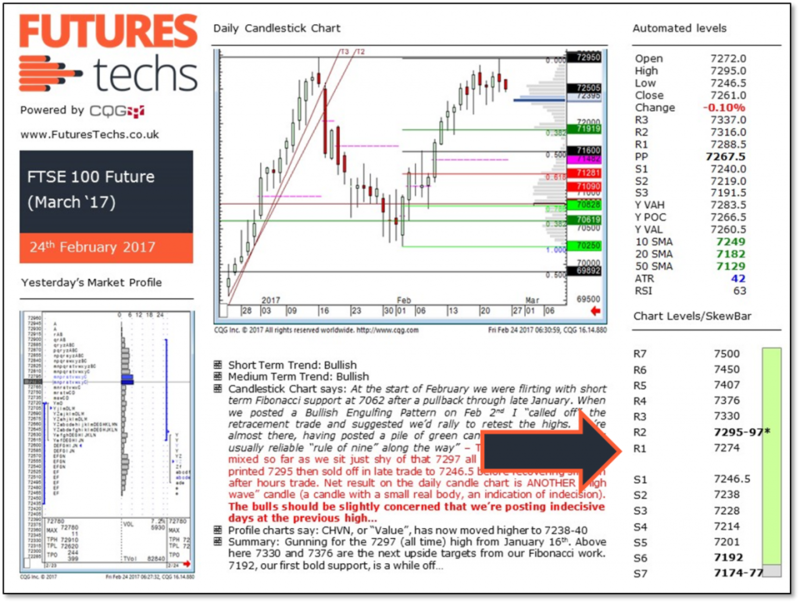 For example at the time of writing this report March ‘17 Futures were trading at a 16 point discount to the “cash” Index, so that 7192 level at S6 is actually 7208 on the “Cash” chart. Green candles are days where the market closes higher than where it opened, so bullish days. Red candles are formed when the market closes below it’s open. 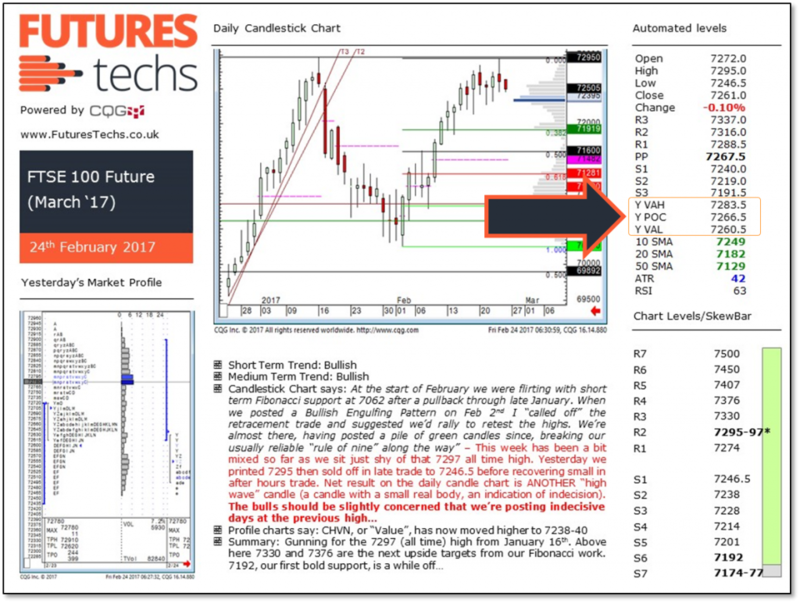 Sometimes we will post “day session only” charts that strip out the overnight price action. Important gap levels can be gleaned from these charts. 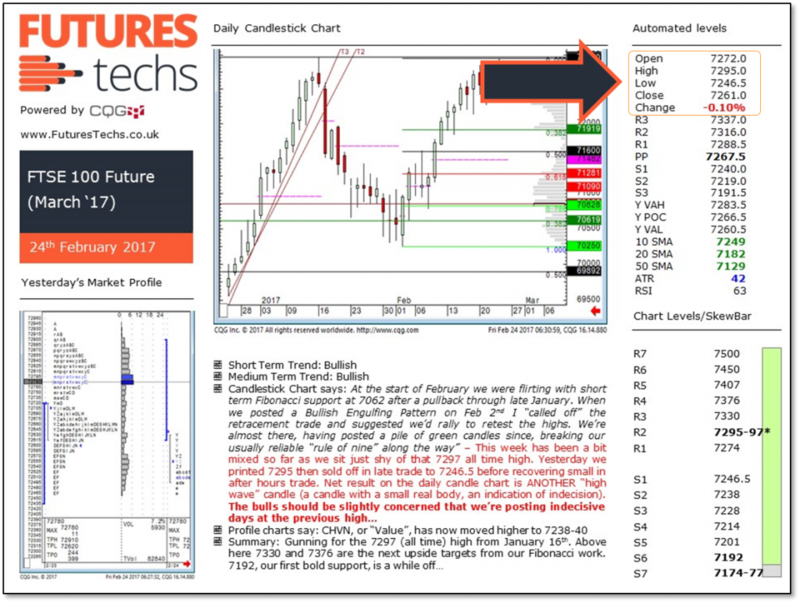 Market Profile chart. Shows the previous day’s Profile. All three of these levels are worth keeping an eye on the following day. 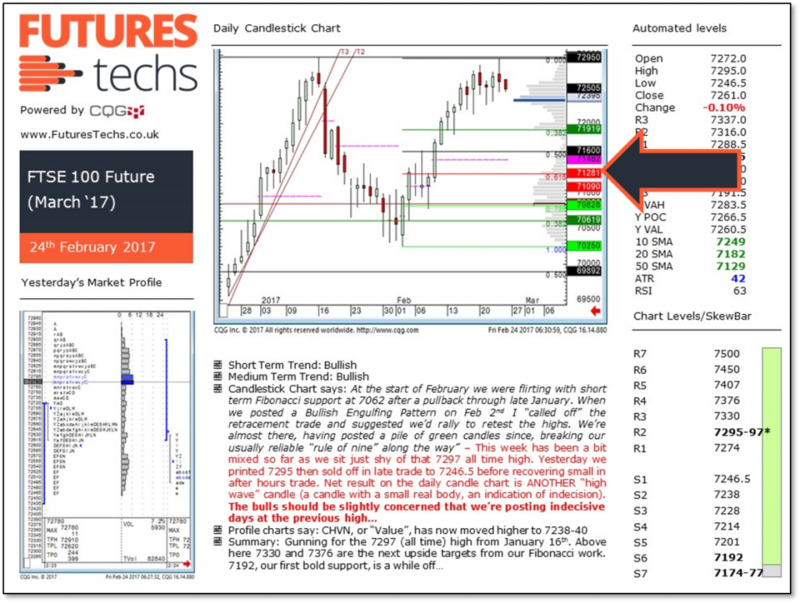 We also highlight vacuum support or resistance levels with a horizontal blue line. “Manual” levels; from our Analysts’ daily review. Levels in bold are deemed most important. 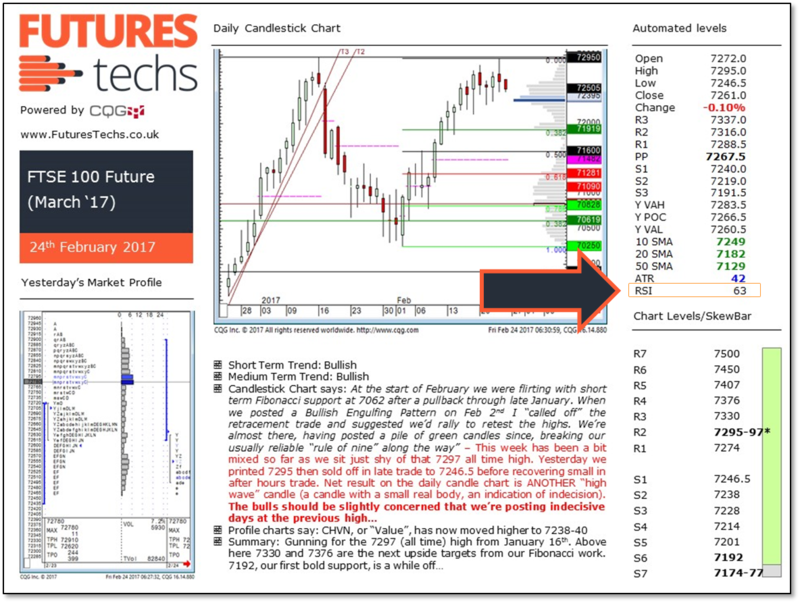 If a level is in brackets it means it could be support or resistance. A level with a “*” next to it is an all time high/low. Pivot Points were commonly used in the days of Pit trading but are not (IMO) so relevant now, although are still referenced by many traders, hence we include them in our reports! The “theory” behind this is that a high reading for the RSI (anything over 75) says the market is get “overbought” and possibly due a correction lower. Conversely an RSI reading below 25 says the selling has maybe gone too far. Text in Italics is from previous days. Text in red is an update. 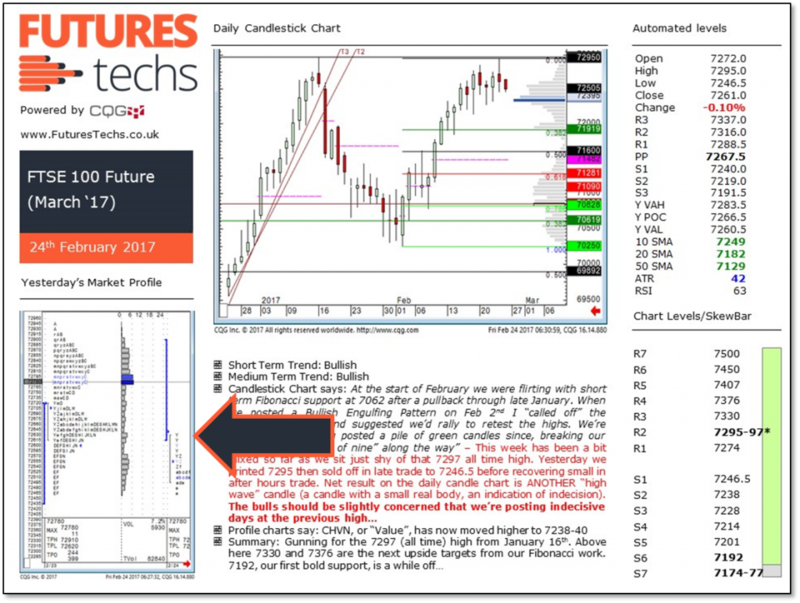 “Medium term trend” is the “bigger picture” direction on the weekly charts. 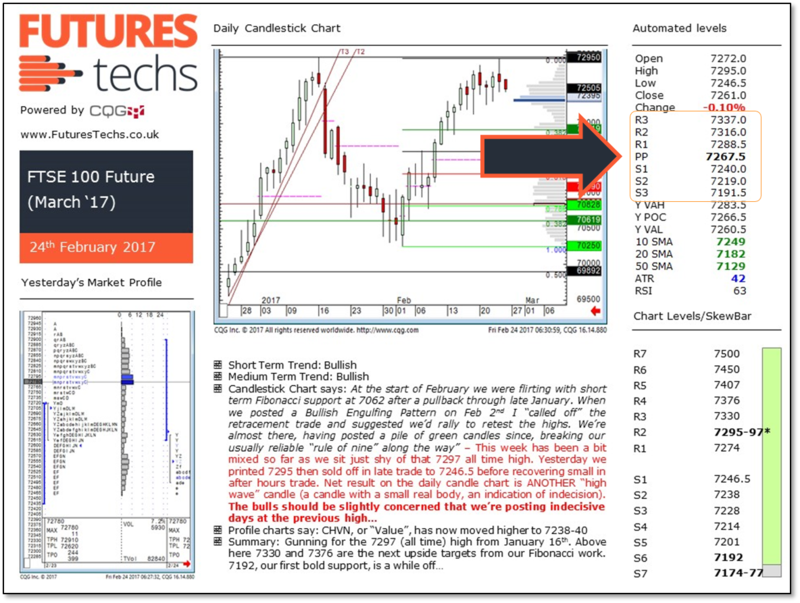 On our Futures reports we post 7 support and 7 resistance levels and also our very own “invention”; the “SkewBar”, coloured in Green, Grey and Red. This is a levels based short term trend indicator. 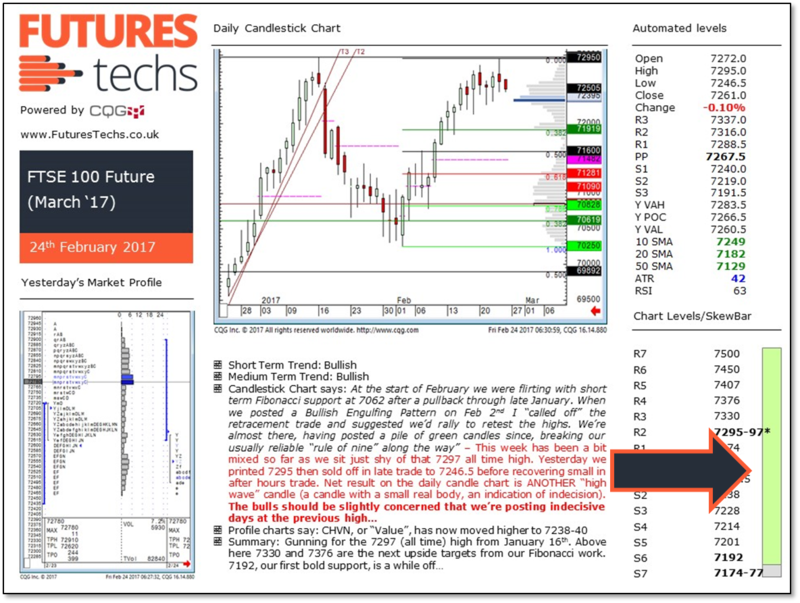 So for this report we are bullish above 7192, neutral below here. There is no red element showing, so we’re a long way from being bearish!